Lívia Páldi: I’d like to start with what you yourself once asked Stephen Prina in an interview1 , namely to define „the relation of your work, that incorporates cultural products from various historical periods, with the world.” What have been/are your most important sources of inspiration? I'm interested in undercurrents of art and cultural developments, in longer historical timelines as can be drawn when looking at and trying to understand our times. But I also feel strongly that each exhibition should convey the adventure of a new start, in the way that artists all over the world are always facing the challenge of making a new beginning in their work... That's why I basically think that for making an exhibition any source of inspiration or theme is valid. The question is more where a theme or source takes you (this goes for both curator and artist). The challenge, in the making, is how to find a balance between experience and innocence. But, getting back to your question, my own inspiration sources come from my life, from the work of artists, and, during the last ten years, from a growing interest in historical art, and the question of how this can be connected to today's art. LP: You started at the Magasin Centre National d’Art Contemporain3, at Grenoble in the early 90s amidst a quieter, and as you mentioned in a previous talk, less defined circumstances concerning the curator’s position. What were the aspects (encounters, models, attitudes, visions, aims, etc) that you found relevant at that early point of your career? MK: Well, the profile of the curator upheld by the École du Magasin in 1990 was quite contrary to that of today's independent curators who see themselves as cultural producers. It was linked to the profile of a museum 'conservateur',4 who is at the service of artworks. As students we were, more or less, supposed to serve artists. The way in which one could do the job, was possibly more open and less developed than today. For me this was confusing. LP: Why? Was it because it opened too many new perspectives and you had to define your own way of being a curator? After finishing the course it was a real challenge to invent myself as a curator and art writer. The good thing about École du Magasin was that one was invested with an ethics about one's position and responsibility as a curator: standing between the artist and the public, one should bring the two together. The French term used for this type of professional says it all: 'médiateur de l'art'. I believe that this is still a very valid position. You recognize it today when you hear someone like Robert Storr discuss art and its institutions; he radiates a kind of responsibility for a whole field. I admire his professional attitude, but have to admit that in Grenoble I was much more drawn to the position of someone like Pier Luigi Tazzi,6 whom I see as a free-floating intellectual/poet. His work as a curator and writer seems mostly inspired by the artist's world. To be close to artists, and work from there in as ”pure” a way as possible, remains a challenge for me. LP: Can you really work in a ”pure” way when context-relatedness/or the dependence on different nets of reference are so obviously influencing production and curating? LP: The NIFCA experience seemed to strengthen certain features that still characterize your work. The project “AMATEUR/ELDSJÄL, variable research initiatives 1900 & 2000” presented in 2000 at the Gothenburg Museum of Art you co-curated with Charles Esche and Adam Szymczyk connected contemporary Nordic practices wih historical investigations of ”repressed or under-valued aspects of the Nordic tradition” like the Pontus Fürstenberg collection, the heritage of Ellen Key, or the discovery of the work of Ivar Arosenius. MK: Due to personal reasons I had to break off my curatorial engagement with NIFCA in the winter of 1998. I regret this, the Nordic art context was thriving at the end of the 1990s, and it was very inspiring to work there and develop projects. What I felt then and still feel is that the Nordic context is quite exotic; as part of the western world, it stands on its own due to quite different but interconnected cultural histories, a particular climate, a way of life... And one still finds these elements in today’s art from the Northern countries… Remarkably, during my time with Nifca I developed a more outspoken historical interest. At around 1900 great artists were active there. Just think of Edvard Munch, Akseli Gallen-Kallela, Einar Jónsson. Seeing their work was a true discovery! It led me to develop a number of exhibitions in which Nordic cultural or art historical elements were juxtaposed with work by contemporary artists, like 'Pictures for the Blue Room' at the Vigeland Museum in Oslo7 in 1998, central to which was figuration today and in the recent past; how do artists depict men? When I first visited that museum I immediately wanted to connect it to contemporary art. It seemed to stand so much apart, but that was exactly my reason; this one-man-museum, with all these works permanently installed, offered a counter-model to the frantic information flow and constant physical movement in which a lot of contemporary art finds itself. There was also a group show in the Nikolaj Church in Kopenhagen in 1999 titled 'Close-ups: Carl Th. Dreyer and contemporary art'8 that departed from a similar, classic thematics. I sense that the experience of making shows like these, including the collaboration in 1999-2000 with Charles Esche and Adam Szymczyk for the 'Amateur' exhibition, opened my eyes to the connections between historical and contemporary art, maybe more in the way artists see them. But it was only through doing this, I mean through the practice, that it became clear to me that there were also chances to show these connections between past and present in exhibitions. "In discussions about interesting art of the 1990s, the emphasis has been put on a new, international context which supposedly informs the work of contemporary artists. Art professionals have been eager to relate the art production from what used to be called the periphery to this context, to the effect that characteristics of art, in particular the way it relates to a local context and local histories, have been underemphasized." How do you see the shifts from the ”interesting art of the 1990s” to current developments? Do you revisit concepts? e.g. : the center-periphery issue, the local/global dichotomy have undergone some discussions. MK: The seminar you mention is a good example of how I like to work, really going into a complex subject. Ina Blom gave a brilliant lecture, called ’The Bind of the Vernacular’. Here she talked, in fact, about how strange close, and therefore seeminlgy familiar, things can appear. She illustrated her story with the work of Olafur Eliasson. I found this very interesting, as it came down to a kind of deconstruction of the 'Nordicness' of Eliasson’s work. But your question about the current developments in art is a big one.. Fortunately, I have had some experience myself in an art field where the horizon has become virtually infinite, working with artists from South Korea and Burkina Faso. I spent some time in both countries and thus had the opportunity to dig into the context. Well, in today's world, we constantly have to negotiate our space, we seem to be continuously engaging in a balancing act between our local and global surroundings. Nevertheless, regardless of geography, a lot of art still centers around questions like where do we stand, what’s the ground under our feet, how do we relate to others, to our environment? I think it's great that we as curators can partake in this big world, but this also confronts us with the challenge of how we can work with the art close at home. To me concepts basically function like steps on a ladder. I'm sure you know Wittgenstein’s idea about the step that takes you to a higher level, but when you're there you don't need it anymore so you leave it behind. While being engaged in research for a project, I often come across material that I cannot use, but stays with me, waiting for an opportunity. And don't forget that certain projects take me a long while to realise. For example, the first idea for 'The Projection Project’, the exhibition that is now on show at Mücsarnok, was born during my stay at Nifca, in 1998. LP: I suppose your current interest in Romanticism, which you are about to develop into an exhibition project with Ann Deemester in De Appel, would also challenge some findings of your Nordic period. MK: Well, perhaps, indeed. I’m interested in the reflective element of Romanticism: an essential part of Romanticism from when it began as a historical movement in Germany, England, France at the start of the 19th century – and maybe less clearly present in the Nordic context where it came later. The first Romantics embraced the world of emotion, but had an acute sense of the dangers lurking in that inner realm. Their approach of affects was not at all naive. I would like to bring that critical element to our exhibition. It’s something we miss in today’s understanding of Romanticism. But I am also interested in the kind of romantic radicality that you find in contemporary art, lived or fictional. Hence the title of the new project: 'To Burn Oneself With Oneself. (The Romantic LifeWork Dilemma Today)’. To explain this title, an important reference is Michael Landy’s ’Breakdown’ from 2002 – a performance in which he systematically archived and then destroyed all his possessions. Extremes of experience, as art, will also be part of this new curatorial enterprise. Of course you’re interested in examples, but I won’t give them yet, because I want the exhibition to be a surprise, a point from where Romanticism appears as a serious project. LP: You have been working in different ways also with different institutional backgrounds mostly as a freelancer and it seems by looking at your activities that the Netherlands and Belgium alone offer you many chances to elaborate and keep working on diverse commissions and projects. The institutional fabric – including cultural agendas, new institutions and, more profoundly: financial distribution – has changed a lot (also in the Netherlands) during the last decade. How do you see/negotiate your position being influenced as a freelancer and also how has this affected your way of working/participation in the system? MK: In the Netherlands and Belgium there is still space to realise projects for freelance curators such as myself, but over the last years I feel more and more that you have to be part of an institution if you want to take part in the streams of events and exchanges that define today's world of contemporary art. Under the present conditions there is a risk of becoming an outsider with the kind of projects I wish to realise. Yet, the subsidy system we have in the Netherlands does allow for new enterprises. 'de kleine biënnale' is an exhibition that took place for the first time in 2004 at a 19th century fortress close to Utrecht.10 Ten artists – most of whom have international experience, while some are at the start of their career – made new work that appeals to children (7-12 years). The second edition was in 2006 and drew 7000 visitors in three weeks. That’s a lot! At the moment we are generating funds to secure the third edition in 2008, after which we plan to make it into a yearly event. By the way, in this context, where we give artists an open brief to develop work that they see as appropriate, I work with Petra Blok, with whom I also collaborated as a curator for Festival a/d Werf in Utrecht. She’s a real fan of my work. LP: As I understood ’de kleine biënnale’ has been developing from a (public) youth/children profile into a ”more mature” (if I may say that) contemporary art event? What changes have you made? Why do you find it still a relevant project? MK: No, that’s a misunderstanding. This project began as a conceptual enterprise with two goals: it had to be interesting for artists, meaning the work they could make in this context should connect to their oeuvre per se and not stand apart. The other goal was that the work should connect to the world of children. When I see the results, it appears as if artists are challenged by our commission. In their art, they speak up more clearly. For example in the edition 2006 there was a great piece by André van Bergen, a huge canon of wood, which supposedly could fire kids. Called ’Here they shoot children don’t they?’ it was erected somewhere on top of the fortress. Well, both kids and adults loved it. LP: Except for a 5-year break, you have been tutoring new generations of curators at De Appel11. What has been certainly recognizable is a rather accelerated rhythm of curatorial education and production that you must meet at your seminars. How do you deal with speed as a demand and a form of operation while many of your projects ask for a great deal of research and slowing down? MK: That's a big question too...but I'm tempted to relativize this speed issue... The workshop I offered to the students of the Curatorial Training Programme of 2001/2002 and 2003/2004 consisted of in-depth-analysis of important exhibitions from recent art history starting with Documenta V. We were in particular looking at the work relationship between curators and artists, to see what was at stake… think for example how Robert Smithson and Daniel Buren turned publicly against Harald Szeeman by means of critical statements in the catalogue of that project. But getting back to your question, speed can be a good motivator, it isn't bad per se; I have also accomplished projects under time stress, for example the exhibition 'Hörere Wesen befahlen: anders malen. ',12 which was about alternative approaches of painting – painting in 3D space, wall painting, painting with video/film... Most important is, of course, finding your own rhythm amidst the currents of today. MK: The title was a way to get out of the deadlock of the painting debate…a little trick so to speak…to talk art seemed and seems to me more interesting than to talk painting… But the artists in that exhibition do something that I find relevant to discussing painting today. They open up the space of the single framed painting, accessing another type of space: architectonic, plastic, psychological. In the show there was work by Klaas Kloosterboer, someone who in fact deals with painting but as a sculptor, always going into real, physical space. He has a work in ’The Projection Project: Budapest episode’, which is about the aggression of the act of looking, and the vulnerability of being looked at. Perhaps such modes are more relevant to our reality, than the old model of the painting as a window on the world. After all, we all use all kinds of other windows that look out onto the world today… But it was great to make this show for the SMART project space, and totally in tune with their ”Blitzkrieg-rhythm”, where you have two or three months to put an exhibition together... Luckily, I knew what I was doing, sometime before I was immersed in a research on painting and its articulations today. LP: The Projection Project13 that brought you to Budapest offers a rather analytical walk via the different landscapes of projections, making the viewer aware of the diverse practices/uses/functions and qualities of image creation/presentation that envelopes our everyday life and visuality. And yes, we do encounter the format far too often, this has actually become the condition we have adapted as visitors – but what do you mean by the aim ”to articulate projection as a project, as a promising technique”? LP: The show obviously draws the viewer into dreamy states but also into the consideration of the spaces/sites of projection and their interferences, the environment they create: white cubes blurring into cinematic boxes – orchestrated encounters, areas of transparencies, permeable sites of exchange. How do spaces influence you? So, spaces and the way you work with them, as a curator, as an artist, can make or break an exhibition. But I guess I am quite used to this, as I have been making exhibitions in all kind of places, varying from empty houses and public squares to art institutions. The point is always how to make a space work for the art. LP: You have become quite familiar with the Hungarian scene in the last few years and that also added new pieces into the ’Projection Project: Budapest episode'. How do you see the production climate here? MK: I’m very happy with the new contributions by Sugár János, Várnai Gyula, and the Június 21 Kollektíva (June 21 Collective). It's unfortunate that I had to leave, it would have been nice to spend more time with these works. This being said, from my visits to artists' studios in Budapest in the summer of 2005, organised in collaboration with Molnár Edit, my impression was that the real potential of the artists here does not get channeled optimally by the institutions. There seems to be a lack of money to make things possible, but perhaps also a lack of serious curatorial questions posed to artists – questions that make a difference. For example, I saw many catalogues of group shows organised around a theme that struck me as irrelevant, much too light. I have nothing against lightness per se, it can be a great weapon, but when you approach artists seriously, confronting them with a question or challenge that matters – in the first place for you –, it will show itself in the result. As a curator I always want to know what is lurking in the artist's world. What are the artist’s dreams? What does (s)he want to make? And it feels wonderful to see that sometimes you can really help to make special things happen. LP: Thank you for sharing your thoughts. The interview was conducted and edited via email between 23rd June and 5th August 2007. 2 Joy & Pain... cat. (Amsterdam: ICA, 1992). 5 There Kremer, as curator of the section Visual Arts, could offer Dutch artists ( like Aernout Mik, Job Koelewijn and Suchan Kinoshita) and their international counterparts , a platform to make new work. Artists would propose their projects, and then suitable places and spaces in the (semi-) public context of Utrecht would be selected for presentations. Eventually, the presentation context was very specific, but the subject of the works was always open. 6 Pier Luigi Tazzi b 1941, Colonnata (Italy), writer and curator who lives near Florence. Artists: Henrik B.Andersen, Vanessa Baird, Anne Katrine Dolven, Alicia Framis, Kristín Gunnlaugsdóttir, Hans van Houwelingen, Aernout Mik, Matt Mullican, Pekka Niskanen, Sophie Tottie and G. Vigeland (1867-1943). 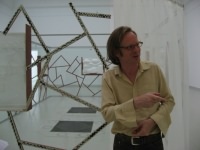 Curator: Mark Kremer, project by Nifca. Pictures for the Blue Room, cat. (Helsinki: Nifca/Nordic Institute for Contemporary Art, 1999). Artists: Bas Jan Ader, Eija-Liisa Ahtila, Richard Billingham, Matthew Buckingham / Joachim Koester, Christoph Girardet, Pierre Huyghe, Eva Koch, Tommy Olsson, Annika Ström and Lawrence Weiner. The exhibition was a co-operation between Nikolaj, Copenhagen Contemporary Art Center and Nifca. Close-Ups: Contemporary Art and Carl Th. Dreyer, cat. (Copenhagen: Nikolaj Art Center / Helsinki: Nifca/Nordic Institute for Contemporary Art, 1999). Guest curator: Mark Kremer, in collaboration with Edwin Carels and Dieter Roelstraete.